The first-ever Michigan KidLib Unconference was held Friday at the Main branch of Clinton-Macomb Public Library in Metro Detroit. In my completely biased opinion, it was a fabulous first time event! We had some minor hiccups but it was still a great day. In this post, I'd like to write a little bit about the behind the scenes work that went into putting MIKidLib together that I did, in the hopes of inspiring more states to put on a similar event. Please also make sure you read (our host) Lisa Mulvenna's thoughts on the day. I know this topic isn't going to be of interest to everyone, so feel free to skip it (and any other follow-ups I may do). If you are putting on a similar event and would like to pick my brain, please get in touch. You can leave a comment below or my email address is available on the about/contact page. Let's go back in time to August 2013. In the Flannel Friday Facebook community, Lisa and I were discussing putting together some sort of professional development event. She had suggested a break out session at Spring Institute (The Michigan Library Association's annual 2-day conference for youth services) and I pitched an unconference instead. A little bit later in the thread, Andrea Vernola offered to help plan and the rest is history. Thanks to Darien Library in Connecticut for inspiring us! Over the course of the next few months we made some big decisions like where and when. Since Spring Institute is going to be on the western side of Michigan (Battle Creek) in 2014, we decided to do our first unconference on the east side. We picked a date that was at least one month away from that event and also other big conferences like the Michigan Library Association's Annual Conference, The Small and Rural Libraries Conference, Public Library Association Conference, etc. We wound up with the month of February left and picked the Friday date that worked best for us. Since there were three of us, we split up the work. Andrea offered to handle arrangements for people interested in carpooling, I built the website, and Lisa was in charge of local and day-of arrangements (food, paper, all that good stuff). Our official budget was $0! We were able to do this because we were meeting in a public library instead of a hotel or conference center, there were no keynote speakers, and we charged attendees for their food ($3 for pizza, $6 for Jimmy John's) although they had the option of bringing lunch from home. CMPL's costs were low too--mostly copier paper and room setup costs. I did a bunch of research on how unconferences ran, as well as emailed people who had put them together or attended them to get their thoughts on things like registration, break out sessions, and other details. I built our website in Google Sites, which was my first time using it. I found it pretty easy to use and would recommend it. Another option would be to use Blogger or Wordpress. I was able to find a template on Google Sites that made everything extremely easy. I used a piece of clip art from Open Clip Art to create the conference logo and added the event's date and city in Paint. 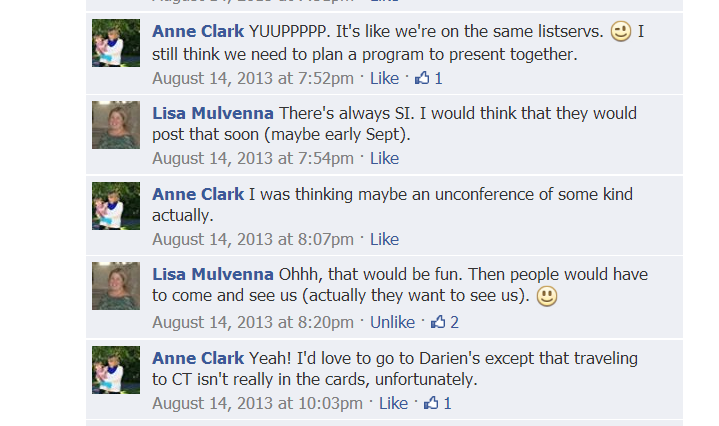 Primarily, we promoted the unconference through our blogs (mine and Lisa's), social media accounts, and listservs. Early attendee feedback has been that the listservs and our blogs were the primary places people learned about our event. I made the online registration form with Google Forms. One change I will make for next year is to have attendees put their first and last names into separate blanks so we can sort the information more easily in Excel as we are putting together the check-in table. I did take the online registration form down a few days before the event so Lisa had time to clean up the information and put it in alphabetical order. In addition to the fields people could see, I added an additional column on the "staff-side" to make a check mark of who had been sent a confirmation email. I originally did not plan on sending out confirmation emails but so many people emailed me to ask if we'd gotten their information that I sent them out in batches. BCC is your friend for this. I had originally hoped that we would get 30 people to register and 20 people to show on the day of. We had about 100 people register and 95 attend. There were numerous cancellations for various reasons in the 2 weeks before the event, one reason we went with pizza or Jimmy John's for lunch. Both places allowed us to order the food on the same day of the event as opposed to other places that wanted 1-2 weeks' notice and pre-payment. The thing I was most worried about was breakout sessions and voting. I had read a bunch of articles about hosting unconferences but I had not seen anyone break down how they handled voting for topics. I did not want to tally these by paper or count hands. I went with yet another Google form for voting. Lisa, Andrea, and I had decided that there would be three break out times, with 4 rooms available during each time. That meant we could have 12 sessions that day. Lisa and I decided to stick the three session topics that received the most votes in the auditorium, the biggest room. Conference room B got sessions 4-6, Conference Room C sessions 7-9, and the Storytime Room (the smallest) sessions 10-12. You can see the final tally of session votes here (if anyone were to vote now, after the event, it would change these values, just FYI). The feedback we have received so far on our survey has indicated that people would prefer 4 time slots for break out sessions of about 45 minutes and fewer choices in each slot (so use three rooms or even two, if they are big enough). I built the Google Form for voting based on proposed topics. It was difficult at first to get people to add topics, but many did after receiving the confirmation email which had a paragraph politely worded to nudge people into doing that. This was really helpful to us since it gave us an idea of how many people might want to talk about certain topics so we knew how many rooms Lisa needed to reserve. I put the topics in a few days before the unconference. We had talked about letting people make last-minute additions but made the executive decision the morning of not to do that. People were able to vote on CMPL iPads that we placed on the registration table. I used a computer to check the tally of votes and assign the rooms and times for the sessions. That's my handwriting in the picture above! I posted this picture to my Twitter account and it was really handy to refer back to through the day, since there were only 2 paper copies of the break out schedules. In the future, I would probably make 4-5. Another piece of feedback that attendees gave us is that it would have been nice to have something for the early birds to do while they were waiting for others to arrive. CMPL and registration both opened at 9 and many people were there right on time. I'm often the last person to arrive for conferences so it didn't occur to me that would happen. In the future, we will probably have someone giving library tours to interested parties at this time. We could also have board games or something on the tables for people to break the ice informally. 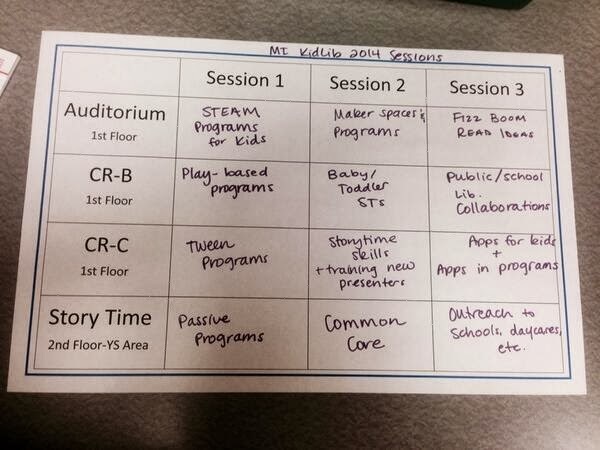 We are interested in hearing from people who were able and unable to attend MI KidLib this year. If you'd like to give us our feedback, please fill out our survey. I will share some more of our feedback once more has been received. There is an opportunity to have a say in when the 2015 event will be held as well as volunteer to help out with planning or day-of work. If you write a blog post about MI KidLib, let me know. I'm compiling a list of them for the website. Our 72 attendees for taking a chance on a first time event and having awesome ideas to share during the discussions and Guerilla Storytime, as well as their libraries for sending them. 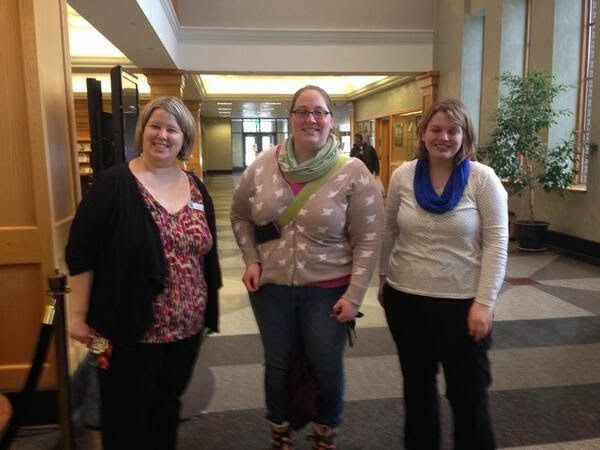 Extra thanks to the librarians who were game to facillitate discussions, take official notes, and/or live-tweet the proceedings using our official hashtag-- #mikidlib14. And of course my family for their support and love.